Communicating with ones chiropractic patients just got a lot easier! The Customer Communication Platform that Designs By Kessler has created works great for any business, but especially for chiropractors in the greater Columbia SC area. Keeping ones chiropractic practice in the minds of ones patients is important we know. 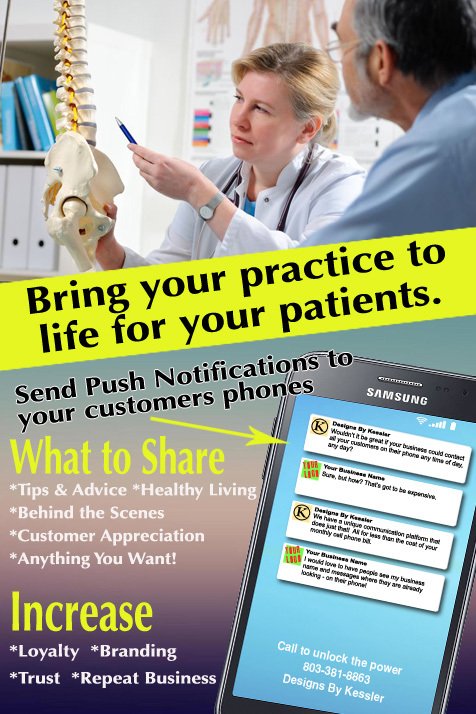 Our push notification system allows for chiropractors to do just that and a lot more. By sharing more about oneself and business, trust and loyalty will grow with ones patients. Designs By Kessler takes care of scheduling and publishing all your notifications you want to send. We will train you on good ways of writing what you want your patients to know. We are not just technology people – we are also highly trained educators (Craig has a Master’s Degree in Education). Communicating via mobile technology is different than traditional advertising and marketing, and we want you to be able to use it effectively.